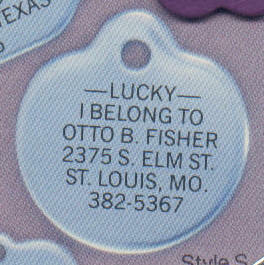 Our lasered stainless steel pet tags are the perfect way to make sure your pet returns home if ever he/she gets lost. 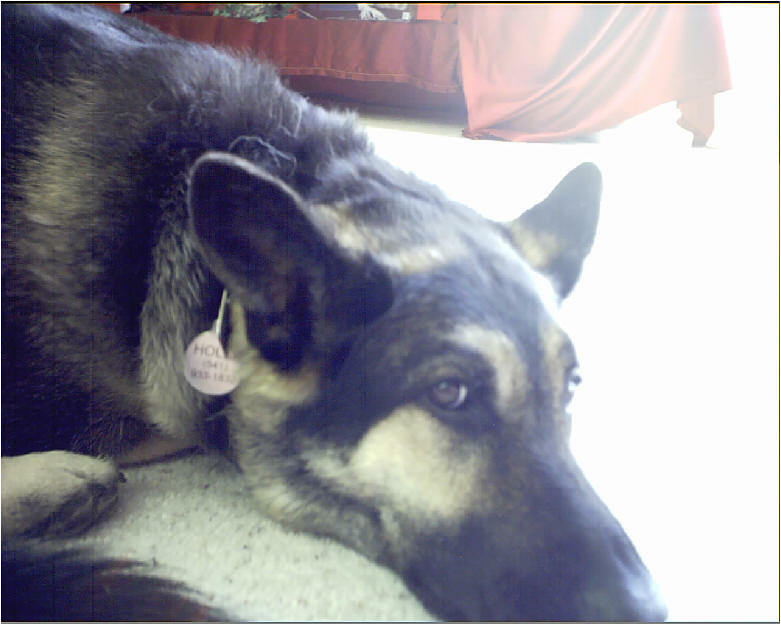 The pet name and phone number on the front side and alternative contact information (vet name & # for example) on reverse shows up clearly even from a distance. Charcoal colored lettering on silver stainless steel only. Lettering does not wear off over time. 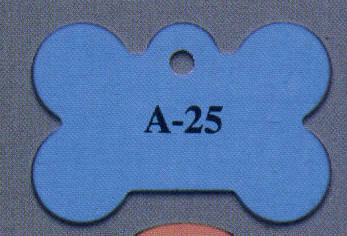 We also have dog tags with the red medical alert symbol if needed (small size only - add $3.00 to cost below). 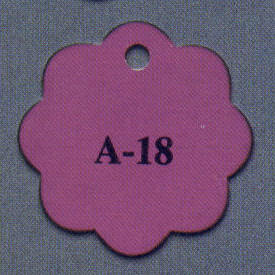 The lighter weight of the tags shown below are excellent for cats and very small indoor dogs. Lettering is silver. $18.95 each with one side engraved, $7.50 for second side engraved. S hook is included. Other shapes and colors are available when ordered in large quantities (25 pieces or more of one color/style). Please inquire. Our plate/stake set is perfect for marking your pets final resting place in the garden. 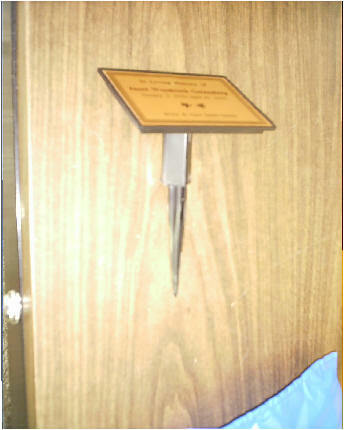 The frame & stake are made of heavy duty plastic formulated for outdoor use. The plastic insert comes in colors other than the gold/black shown. The insert material is UV stable and has a life expectancy for approx 3-5 years, and even longer if not exposed to extremely harsh weather conditions. The set shown above is priced at $45.20, and the engraving is included. For markers that have a longer life expectancy, we do have cast pet grave markers - ask us about them if this will suit your needs better. 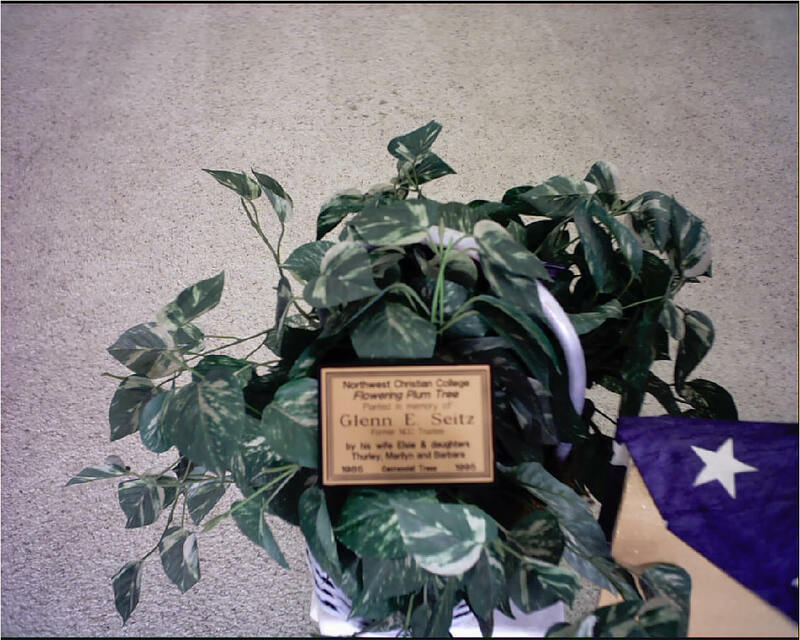 Our pet urns come in two sizes - small (28 cubic inches) and large (73 cubic inches). 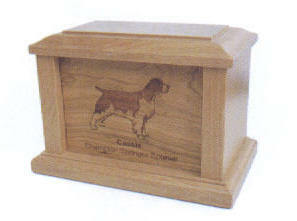 These urns are solidly built from Alder, and your pet's photo and identifying information is lasered on the front side of the box. Black & white photo, or photo with good contrast will give the best laser rendition. Art charges of $40 per hour may apply if your photo is not laser friendly and needs to be converted to line art. 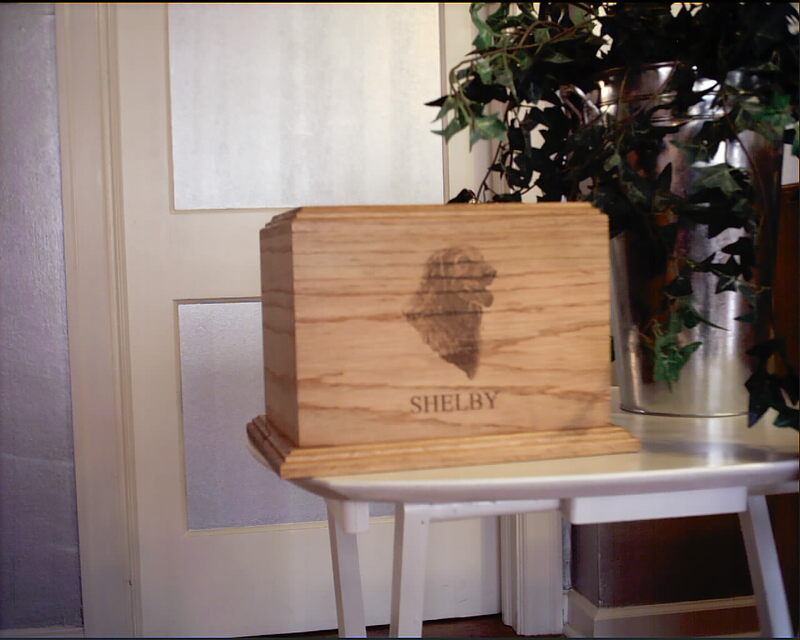 If you already have an urn, and would like to have a custom photo lasered on it, we are able to provide that service also for most styles of wooden urns. There are size limitations to what will fit in the laser machine, but do contact us if you are interested in finding out more about this service.